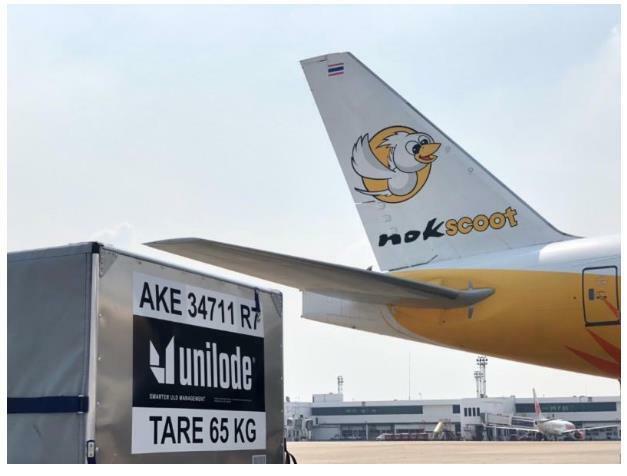 NokScoot has awarded a ULD management contract to Unilode Aviation Solutions, a global provider of outsourced unit load device management and repair solutions. Yodchai Sudhidhanakul, NokScoot CEO, commented: "By commissioning Unilode for the management of NokScoot's containers and pallets for our current fleet of five Boeing 777-200, we will receive cost-effective and professional services, which will provide us with peace of mind and allow us to focus on our core business of flying passengers. One of the key arrangements with Unilode is the replacement of NokScoot's heavy containers with lightweight ULDs, which will take place in the first few months of our partnership." Unilode's CEO, Benoît Dumont, added: "Unilode has further strengthened its global ULD management market leader position with its recent contract wins and renewals and we are pleased to welcome NokScoot as Unilode's forty-fifth ULD management customer. NokScoot's network is a great fit for our ULD pool, which is beneficial for all Unilode customers flying to the same destinations in North Asia and the Indian subcontinent. NokScoot is a modern airline, with appetite for innovation, and has already approved Unilode's ULDs equipped with digital tags to be carried on its aircraft while Unilode is rolling out its ULD digitalisation programme worldwide, including the reader infrastructure. We look forward to working with NokScoot and growing our partnership together."